Sometimes, I seriously overthink my Instagram captions. I put way too much thought and time into them—almost as if they are mini blog posts. Why? Often it’s genuinely because there’s something I just want to express. Other times it’s because I feel this pressure to post daily, or say something important that will last beyond the few seconds someone will spend looking at my post. The truth is, Instagram users do favor accounts with consistent content—i.e., accounts that post once a day or more. It comes down to the Repeat Exposure marketing principle: The more we see something, the more familiar it becomes and the more likely we are to know it instantly when we see it and even look on it with favor. So with an end game to post more often on this platform that has done amazing things for my clients, I started analyzing some of the top accounts on Instagram, and looking for patterns among their captions. The data I collected was fascinating… but for today’s intents and purposes, I want to share some caption prompts I was able to come up with from my research to streamline the posting process for you. 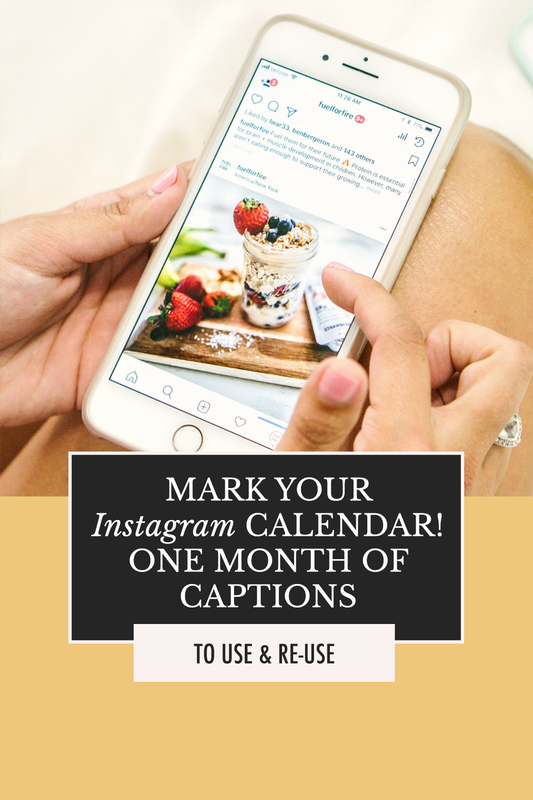 These captions are completely customizable to your brand. Like journal prompts, you take the concept and make it work for you. The captions you come up with can be short, long, clever, serious, low-impact or high. And since you can reuse the prompts once you’ve cycled through them, they’ll help ensure you have something to post Monday to Friday every month! Are you ready? Here are 5 to kick us off—hover over each image for a sample of how to use the caption at hand, and to get the rest of the captions, scroll to the bottom of this post! #1: Taking a break from _____________ for some much-needed ____________. #2: Even on the hardest days, I’m always grateful for ____________. Bonus points: Use 11 hashtags that are related to your industry and which other users might be searching on Instagram to find people like you. #3: If I got to _____________ all day, every day, I’d be the happiest ____________. Bonus points if you tap 3 of the hashtags you put into your caption and engage with 3-5 other profiles using them, too! #4: The face I make when _____________. Bonus points: Screenshot your Instagram grid after you post the image that goes with this caption, and share it in your stories. Scribble over the image to hide it and create some mystery, and re-write your caption as a teaser that will get people to visit your profile. #5: Perk of being a _____________: I get to ____________! Bonus points: Once you’ve completed all 5 prompts on this list, share with me how your engagement changed—if you gained more followers than usual, or your likes or comments increased. Just tag me in your last photo before when post it, and DM me your results @alexisthegreek! Are your wheels turning? If so, you’ll love the rest of this list! You’ll actually get 20 more captions, which is enough to fill a whole month, so between this post and the rest of the captions you’ll get 5 weeks of prompts, which means you won’t always start each month on the same note. Grab the Instagram Social Calendar (it’s $0) at your best email using the box below. If you think of it, use the hashtag #atg20in30 whenever you use a prompt so I can see the creative ways you use the list! Pop in your best email and get the social calendar that makes Instagram oh-so-easy! Thank you! Your list is on its way. This might take a couple minutes. Be sure to check your spam or promotions folder - these emails can be sneaky!